It could be argued I need another bike like I need a hole in the head, but indeed I have been spending the summer readying a new custom built machine. This time from Seven. This actually caps a year and a half saga to build up an S&S coupled bike that perhaps I’ll go into another time, but when I finally got around to engaging Seven, things moved quickly. This weekend I got it out for its maiden voyage. A bit of history… The whole point of doing this was to build a bike with S&S couplers. You’ll see a picture below of a coupler. 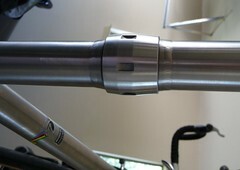 As their site says, a coupler “is a precision lug that is installed in a bicycle frame […] to allow it to separate and pack for easy transportation.” In other words, they make any bike a travel bike. I had thought about maybe just retrofitting one of my older bikes. My old Trek would have been a decent candidate but it’s aluminum and there are many things that make it impractical if not impossible. Retrofits do work out though. 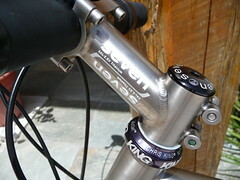 Kem retrofitted her Merlin and it’s made it an excellent travel bike. In the end, I decided just to go ahead and get a completely new bike. This time I went with titanium. 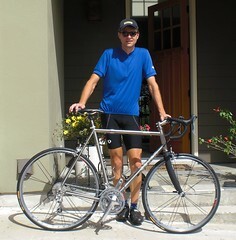 The S&S website has a great list of framebuilders but I quickly settled on Ti from either Moots, Merlin or Seven. I chose Seven. The main reason was a local referral and a meetup with a Seven rep who just happened to be in town. But truth be told, they also just have a good website and it had the information I was after and a product line that met my desires. The main reason for the Ti was I wanted an unpainted bike and Ti performs and looks great unpainted. 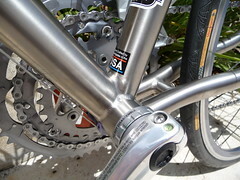 A travel bike takes more abuse in handling than a normal road bike. Why worry about paint? And when you travel you can’t pick the days you ride. You’ll probably still go even if it’s raining. 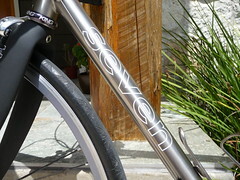 While I love the feel of steel, I wanted to avoid worrying about corrosion. The other reasons for frame material choice get more complicated. Suffice it to say, my choices during the process were designed to yield a bicycle that was lively to ride but comfortable. So, how does it ride? I must say I’m very happy with the results so far. It’s indeed a lively ride, though not harsh. 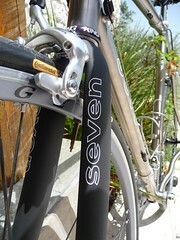 It’s light and responsive and feels great climbing hills. 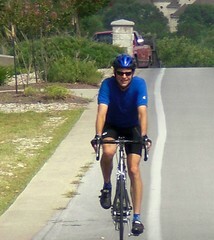 Out of the saddle and cranking hard on it, I find the stiffness pretty much ideal. There’s a solid feel to the ride and I felt confident in steep, fast descents. I did find myself feathering the brakes just a little though when descending down curvy roads that I otherwise wouldn’t. There’s nothing squirrelly about the ride. In fact, I’d say it’s very responsive and predictable. There is, however, a slight difference in the fork rake between this new bike and my Waterford, and it’s just different enough to be noticable and be something to get used to. The couplers are rock solid. The one thing I did notice though was the cable splitters. 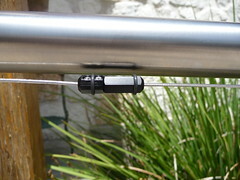 These allow the cables to be split when the bike is disassembled. They’re kind of big and when the road gets rough, they make a noise against the frame not unlike the noise of the lines of a flag pole when the wind causes them to rattle against the pole. A light pinging sound. They have rubber bumpers built into them to limit the noise but it’s inevitable it’ll make some noise. All in all, I’m looking forward to the places I can go with this bike. such a cool bike!! but i think you’re gonna need some badass black/silver/white rock racing gear to keep w/the new ride!